Hello Guys, Airtel Is The 14ptst Telecom Network In India. Using Of Free Internet By Airtel Is Most Popular And We Thing Many Person Will Be Know About It. We Have Posted Here Many Tricks For Free Internet Like. 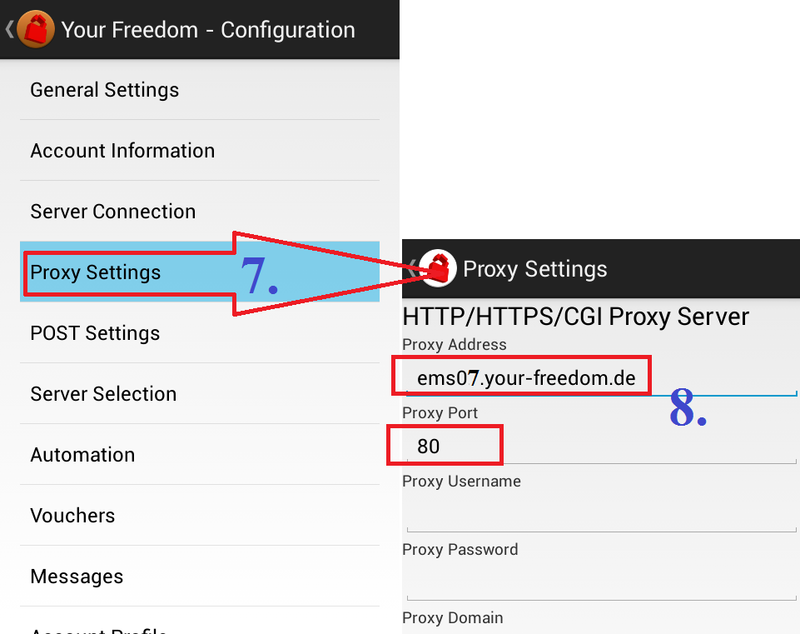 Proxy Tricks, Opera Mini Handler Trick, PD-Proxy & DroidVPN Trick and OpenVPN Trick for Android & Pc, Your Freedom VPN Tricks. Using These Tricks You Can Access Free Internet On Mobiles As Well As On Your Computer Without Any Data Pack On Zero Balance By Airtel. 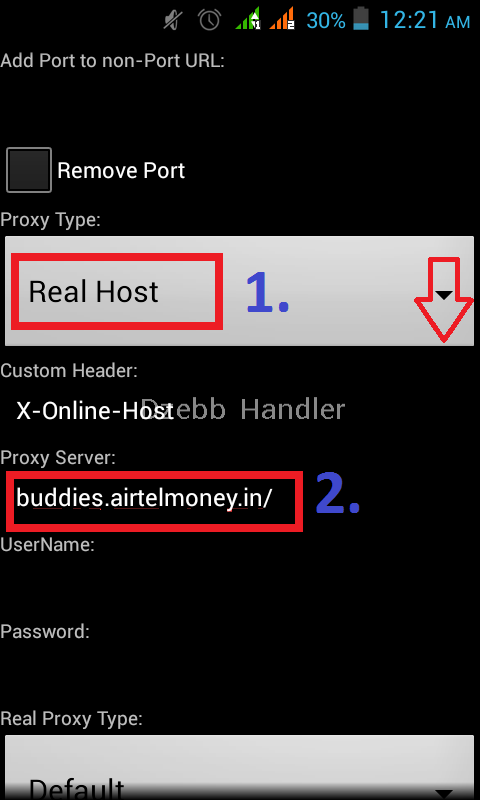 So Now Continue This Series We Are Writing A New Post/Trick For Airtel Users. UC Browser Handler Trick Is Similar To Opera Mini Handler And Process Of Both Handler Apps Are Same. Note: Currently This UC Browser Handler Trick Is Not Support Downloading But We Are Promises That We Find Proper Solution And We Will Share Soon As We Could. 1. This Trick Is Also Work on Zero (0) Balance. 2. This Trick Support Searching and Surfing Only. 3. Also Good Work in 2G Network. 4. Downloading Not Support, But If You Already Know How To Download From UC Handler You Would Be Share With Us. 1). First Of All Download UC Browser Handler Android App. 2). Now After Download, Install and Open UC Browser Handler. 5). And at Last Click on :>> " Save "
Pen Drive, SD Card Is An External Removable Drive Of Mass Storage. We Can Use It For Data Transfer And Storage. The Good Thing Is That Size of These Is Very Small. So We Can Take Anywhere With Us. Many Times When You Connect/Insert Your Pen Drive to another PC, I Think You have Faced a Common Problem That Your Pen Drive All Data Convert/Change into Shortcut Files. This Reason of This Problem Is The Shortcut Virus. This Shortcut Problem Only Occurred When another PC Already Affected By Shortcut Virus. However Shortcut Virus Is Not A Very Dangerous Virus But It Is Really Irritating When Our Data Change Into Shortcut. What Is Shortcut Virus: Pen Drive Shortcut Virus Is The Very Famous Virus, This Virus Change/Convert Your All Data/Content In Shortcut And Also Change/Convert Your Data Into System Files Which Is Always Hide Or Invisible. The Shortcut Virus Can Not Remove By Antivirus Software. Many Person's Didn't Know About That How To Change Shortcut File In Original File Or How To Solve Shortcut Problem Or How To Remove This Virus And After having Hopeless at Last Somebody Format His Data Storage Device (Pen Drive). So Friends Use These Below Methods And I Hope After That You Don't Need To Format You Data Storage Devices. So, In This Article We Are Going To Explain That How To Remove Shortcut Virus And How To Show Your Data In Original Format. First Of All Make Sure That You Didn't Format Your Pen Drive. Well If You Did Format It, Then I Can’t Help You On This One. So Now Plug In Your Pen Drive And Follow Any One Method Or You Can Also Use All Methods. Note: Don’t Forget To Replace the Letter H:\ With Your Pen Drive Letter. That’s It, Just Wait Few Seconds. Then Open and Check Your Files in Pen Drive and I’m Sure That They Were All Normal as Before. The Above Method Is Not A Good Solution Of Shortcut Virus Problem This Method Only Unhide Your All System Files And This Method Doesn't Remove Any Virus. So Use This Below Methods If You Are Not Satisfied with Above Method. Method 2). How To Remove or Solve Shortcut Virus Problem in All Drive Using a .Bat File. If Your All Drives Are Infected To Shortcut Virus Then You Have To Run Above Command Separately For Each And Every Drive, So The Solution Of This Problem We Made This .Bat File For All Drive (Other Than C:\ Drive). After Download, Now Simply Open >> Double Click on This .Bat File. Now A Command Prompt Will Open And After Few Second It Will Automatically Close. That’s It, Open Your Pen Drive and Check Your Data in Pen Drive. Method 3). How to Solve Shortcut Virus Problem in PC or How to Remove Shortcut Virus from Pen Drive or Other External Removable Drive Using – USBFIX Windows Free Software. This Method Is The Easiest And Best Method To Permanently Remove Shortcut Virus From PC As Well As Pen Drive, SD/Memory Card. It Also Remove Shortcut Virus From Your PC Internal Hard Drive. 2. Now After Download, Install, And Open "USBFIX" From Desktop. Note: Make Sure You Have Plug In / Connect the All External USB Device (Pen Drive, Memory Card, and HDD) To PC Which is Infected by Shortcut Virus. 3. Now Click On => “CLEAN” Option Icon on Start Screen of USBFIX. 4. Now Follow Next Pop-Up Screens And Click On => OK, Now => NO, Now => OK, Last >> NO. Note: While Cleaning, You Will Lose Access To Your Desktop, But This Is Normal. That’s It, All the Process Have Been Done. Once Cleaning Is Over Check Your Pen Drive And I Hope Your Shortcut Problem Have Been Definitely Solve. Hello Everyone, Today We Are Going To Share With You Another Free Mobile Recharge App. And With This App Can Earn Up To Rs. 500 Just By Invite 10 Friends (Rs. 50 Per Referral). 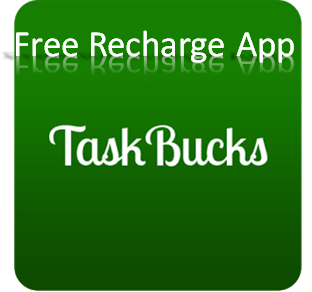 This Free Mobile Recharge Earning Android Application Names Is: “TaskBucks”. 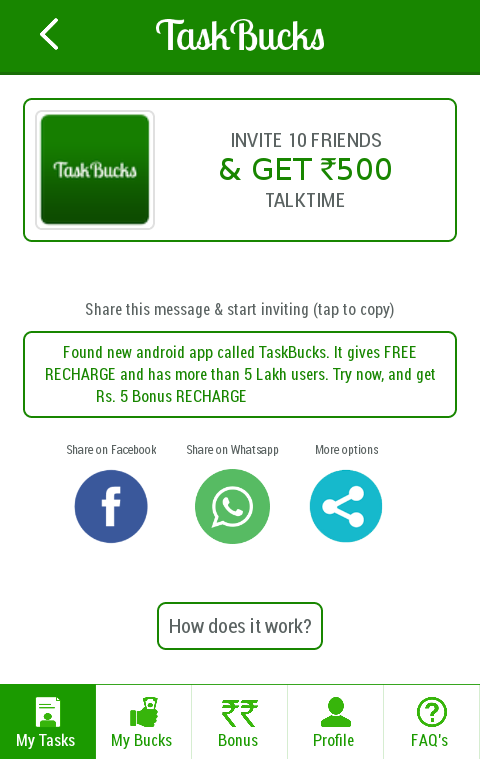 TaskBucks App Is A New Free Talktime Mobile Recharge App Which Gives Free Recharge On Completing Tasks, It Means You Can Earn Free Mobile Recharge By Downloading Apps, Completing Offers And Sharing Contents . And Here You Will Also Get Rs. 500 Or Unlimited Free Mobile Recharge Just By Referring Your 10 Friends. TaskBucks Also Give You Rs. 5 As A First Time Welcome Bonus!! Rs. 500 Referral Condition (Rs. 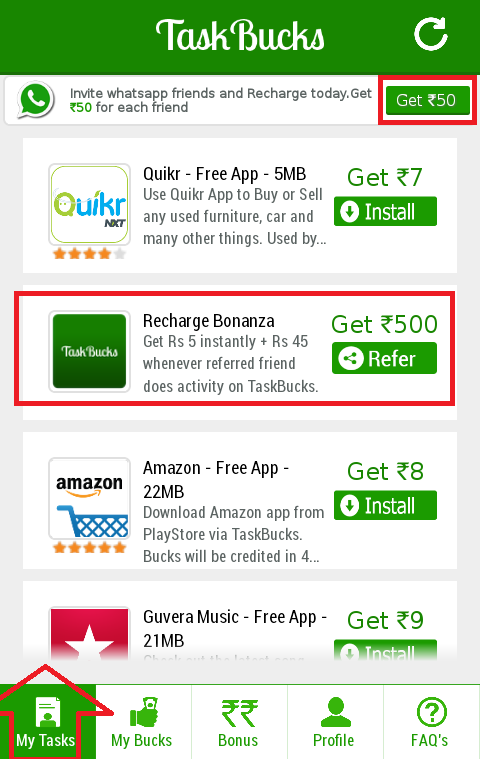 50 [5+45] For Each Friend Who Download/Joins TaskBucks App Through Your Referral Link): - Invite Friends When Friend Install TaskBucks App You will Get Rs.5 Instantly And Whenever Referred Friend Does Some Activity (Download Minimum One App Or Complete At least One Offer) On TaskBucks App You Will Get Remaining Rs. 45. So Let’s Try/Complete Some Simple Tasks And Get Free Talktime. Very Small Size App [755.72 Kb]. Minimum Balance (Bucks) Is Require Rs. 20 In Your TaskBucks App A/C For Doing Recharge. 50 New Users Every Day Will Win Rs. 100 Free Talktime On Completing Task. 2. After Install The TaskBucks App, Now Open It. 3. Now Register Your Mobile Number. And Confirm Verification Code. 4. After Complete Registration Of Mobile Number, You Will Get Rs. 5 As A Welcome Bonus. 5. Now You Will See Many Tasks/Offers In The “My Task Tab”, Then Select Task/Offer, Download Apps & Complete Task/Offer To Get Reward. Offer/Task Means - Download Shown Apps In My Task Tab Through Play Store. After Install App, You Are Required To Open The Installed Apps For About 30-60 Seconds, After Then Come Back On TaskBucks App And Get Reward Money/Credits In Your TaskBucks Account. So What Are You Waiting?? Complete More Offers/Tasks To Get More Money. 6. 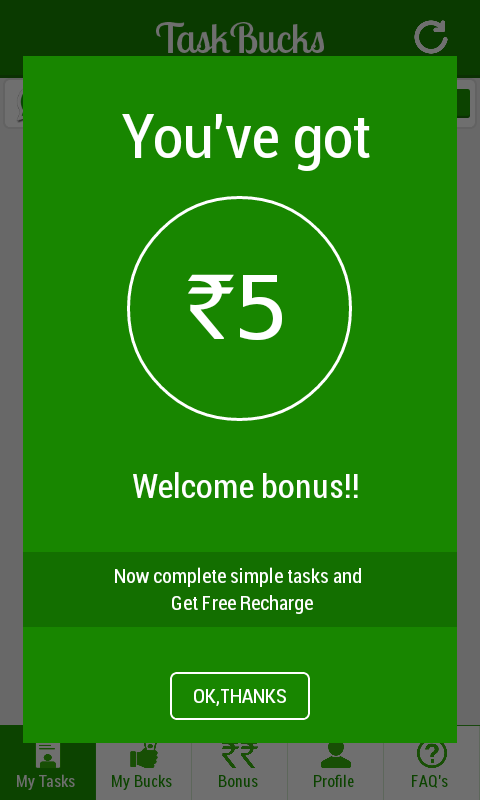 Get More Bucks/Recharge To Invite Friends (Rs.50 Per Refer) – Go To “Bonus Tab” Or Click On “Recharge Bonanza” In “My Task Tab” And Share Your Referral Link With Your Friends On Facebook, WhatsApp And More And You Can Earn Unlimited Bucks/Talktime By Referring Many Friends. Computer Is a Machine and You Can Do Anything on It. And It Is Firstly Used By Many People for Entertainment Purpose. You Can Store/Save Any Files In The Hard Drive For Future Use. But Some Times When You Are Doing Work on PC Accidentally Deleted an Important File By Mistake or Lost Something Important When Your Computer Crashed That You Did Not Wish To And Wanted To Restore It From Recycle Bin But Did Not Find It In The Recycle Bin? You Probably Deleted It Permanently With (Shift + Delete=Deleted Files Doesn't Go Into the Recycle Bin) or Emptied the Recycle Bin. Now What? Don't Worry, You May Still Have A Chance To Get It Back. So, In This Article Today We Are Sharing That How Can Recover Permanently Deleted Files Or Data From Your Hard Drive Or Any Other Removable USB Storage Device Like Pen Drive, Memory SD Card In Windows 8.1, 8, 7, Vista, XP, Instantly . 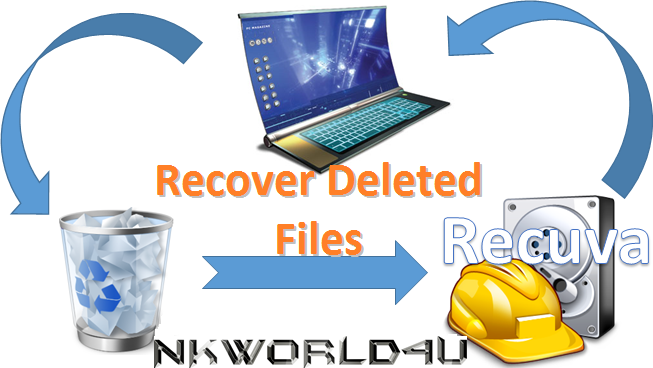 This Data Recovery Tool/ Software Named Is “Recuva Data Recovery”. 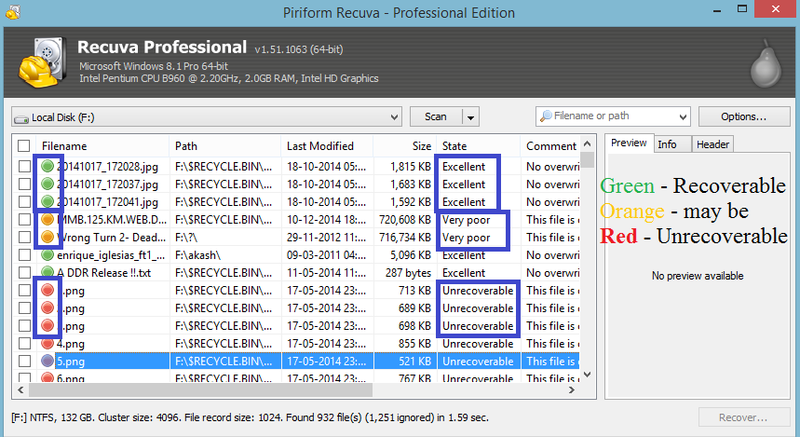 However There Are Several Good File Recovery Programs Available But Recuva Is The Great And User-Friendly File Recovery Application. And It's Free! Recuva Recovers Files Deleted From Your Computer Hard Drives, Recycle Bin, Digital Camera Card, Removable Storage's, Pen Drives, SD Cards Or MP3 Player. It Doesn't Matter How Data Is Lost Or Deleted, It Is A Powerful Utility That Performs Efficient Recovery Of Files Such As Photos, Videos, Music, Documents File, Compressed Files, Emails, Etc. 1. After Download Just Extract Zip File In a Folder And Install And Open Recuva from Desktop. 2. Second Using Recuva Manually Scan (Quick Scan) Or Recuva’s Deep Scan. 1 [FIRST]. 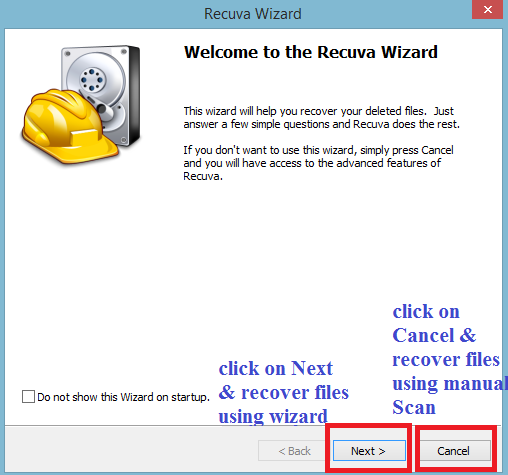 Using The Recuva Wizard – Recuva Wizard To Ask You Various Questions To Help You With Recover Deleted Files From Your Hard Disk. 2 [SECOND]. Using Recuva Manually Scan (Quick Scan) Or Recuva’s Deep Scan. You Will See Three Colors Files. Green Icon Means: Files Have in Excellent Position And 100% Recoverable. Orange Icon Means: Files Have in Very Poor Position and It May Be Recovered or Not. Red Icon Means: Files Have in Unrecoverable Position And It Couldn't Recover. Note: Deep Scan - If You Not Found Right Result After Scan Or If Previous Scans Have Failed To Find Your Files, Again Scan With Deep Scan Feature But It Will Take More Times In Scan, Depend On Drive Size. Enable Deep Scan from Here Click On >> Options >> Action Bar >> Check Mark on Deep Scan (Increases Scan Time). Welcome Friends, Hope You Are Enjoying Our Blog And Tricks. In This Article Today We Are Posting And Introducing A New Method/Trick Of Free Internet For Airtel Free Internet. 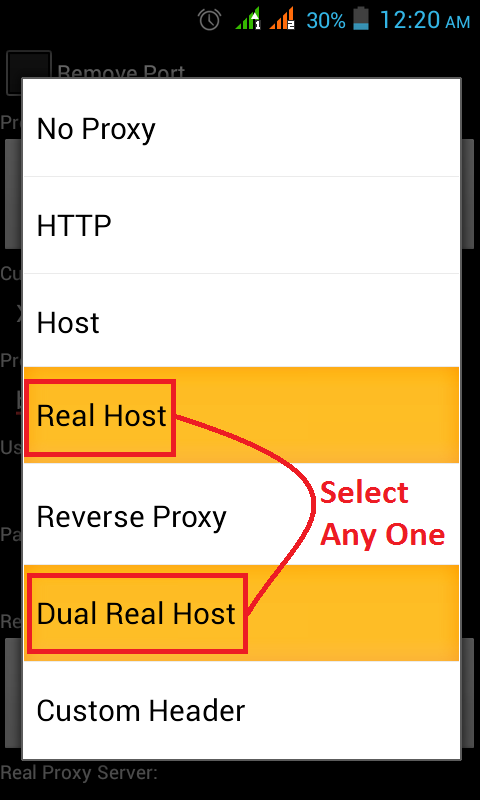 This Trick Also Works Same As OpenVPN Trick On Android Mobile And PC. Using This Trick Or Method You Can Use Any App On Your Android Mobile. In This Trick You Need Not To Any Change Like. Password, Proxy. It Means Just Once Setup And Use. 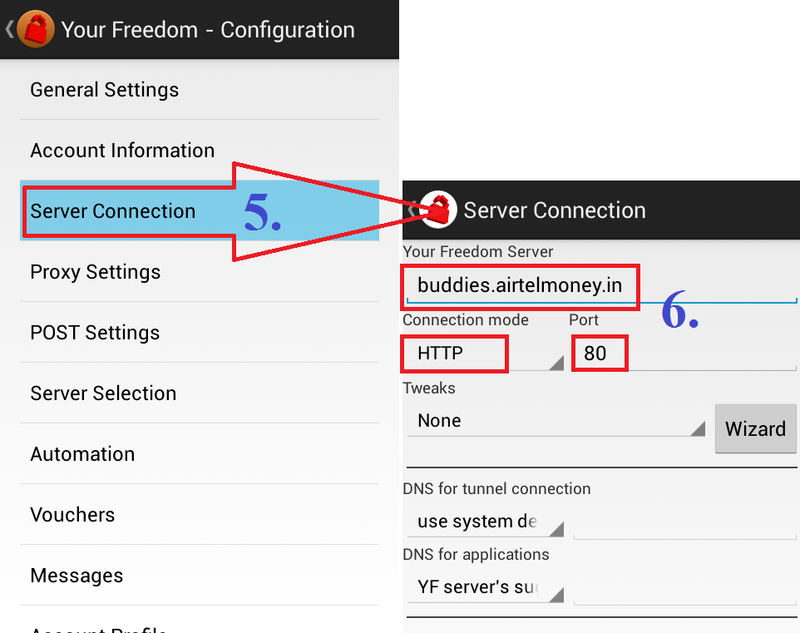 This Airtel Free Internet Trick Is Based On “Your Freedom” VPN Client Android App. And This Is Very Simplest Method Of Free Internet For Android Users. 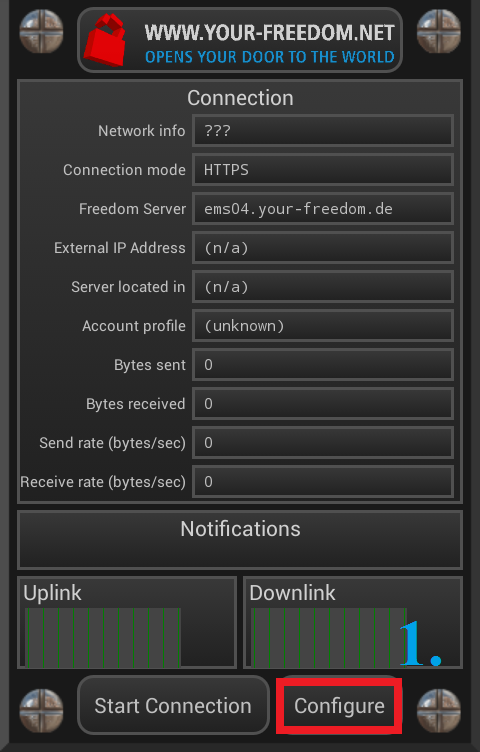 What Is Your Freedom VPN Client: Your Freedom Is A VPN Client Application and It Used For Hide Real Network IP Address, Origin and Identity, Unblock Blocked Website, Remove Restrictions, Firewall and Proxy Bypassing, Traffic Encryption. In This Article We Are Sharing That How To Use Your Freedom App In Android Mobile For Free Internet And How To Use In PC/Laptops We Will Share In The Next Post. Maintain Main Balance Rs. Zero (To Avoid Balance Deduction). 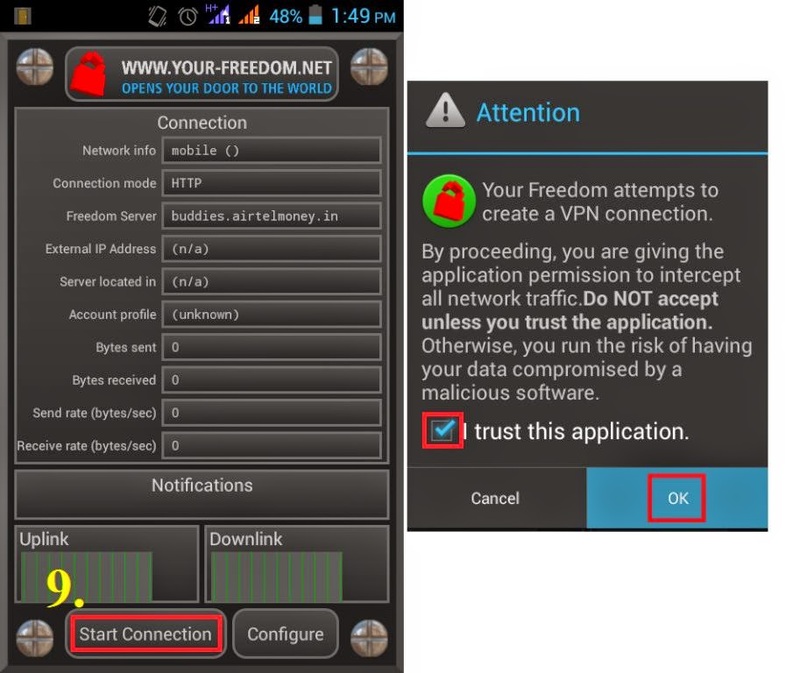 Your Freedom App Works Same As OpenVPN For Android App. This Trick Is Only For Android Mobile Users. 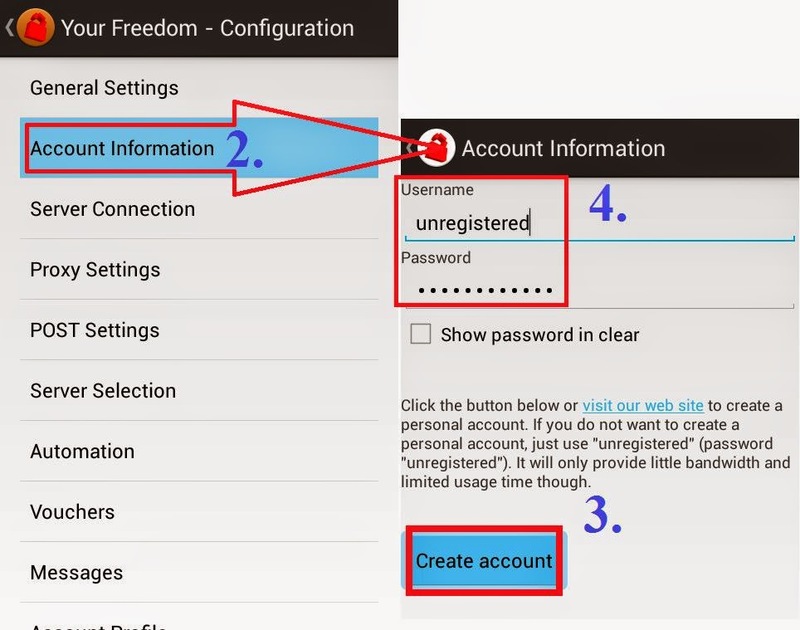 In This Trick You Don't Need To Change Password And Proxy. Use Default Internet Setting Of Airtel (Airtel Internet). Don’t Use Any Proxy In APN Settings. You Can Use Any App And Browser On Android Like. WhatsApp, Facebook, Hike, Play Store and Much More. Free Account (Free freedom) Users Can Use 1 Hour Continuously, Up To 2 Hours in Any 24 Hour Interval, Up To 5 Hours in per Week Interval. Please Always Remember It And Don’t Comment About It. Only Solution of This Problem is That Upgrade a Premium Account or Make More Accounts, And Use It. 1. First Of All You Have To Install “Your Freedom” Android App In Your Android Mobile. 2. After Download, Then Install And Open Your Freedom App. (Now Fill Username, Password, Email Id Fields, Nothing Else Is Require And Create Account). Note: Account Making Is Not Compulsory, You Can Also Use With Unregistered Username and Password, But It Will Only Provide Little Bandwidth and Limited Usage Time Through. So We Suggest Please Make Account. That's It, All The Steps Have Been Done. That's It. Now Open Browser Or Open Any App Like... Play Store, Google, WhatsApp, Gmail, Facebook Or Any App's And More. And Surf Internet Absolutely Free. 100% Working In Rajasthan, Delhi (Personally Checked).